We didn't always have computers or mobile devices. When I was a kid, model kits were a relatively inexpensive way to entertain a boy for hours upon hours when we weren't playing outside. Assuming of course the child could tolerate the toxic fumes of the paint and glues and that mom and dad didn't mind having to wrap half the house in newspaper so as not to permanently damage their furniture. I was very lucky in that both of my parents encouraged everything I did. Especially anything creative. I used make the most hideous creations, then sell them [back] to them to turn a profit. 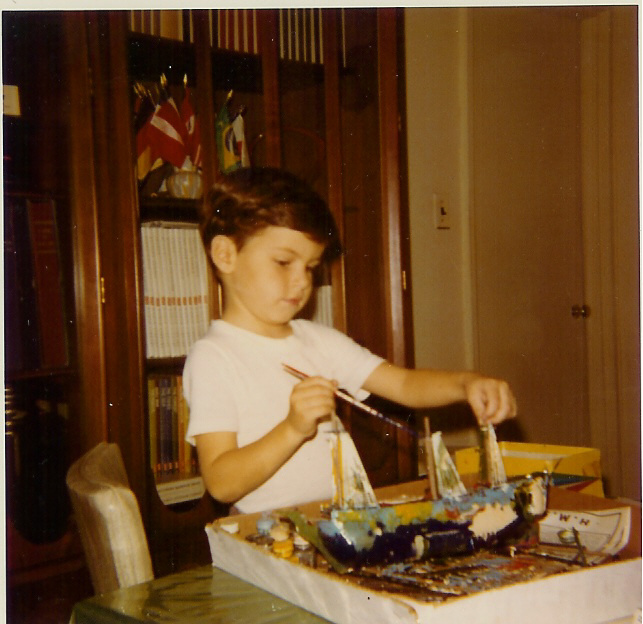 My dad would buy ever more complex kits, even though he knew I would just paint them over and over - like the ship I'm making a mess of in the photo at left. How I started is probably not all that different from anyone else who practices this hobby (or as some call it, artform). From building and painting plastic models my dad bought me, I never really put it down though. I did back off from building plastic models for a time- my dad also had a wicked HO railroad that took up a third of our basement, and I also played Dungeons and Dragons (we can admit that now, right?) for a time, which required painting miniatures to enhance the game. Of course the inevitable "other interests" during high school and college played a part as well. All conspired to less output, but not really a loss of interest and not a full stop - I still would tinker with the great Tamiya kits of the time. I did keep my skills somewhat sharp though since I originally wanted to become an architect - so my focus just shifted from 3D objects to 2D renderings, plans and illustrations. In time that changed and I shifted majors to History and Art - which one day all came together during a visit to NY's Compleat Strategist. Sitting there was a Stadden 90mm figure of Napoleon that just caught my eye and led me to go after any information I could - coincidentally I was taking a class titled "The French Revolution and Napoleon" - it all began right there. In that store. From that point on, I sold off my plastic models (in the days before ebay, I think I got $4 for $500 worth of kits!). I bought the two issues of Military Modelling (from the UK) and began sending out IRC's for every list and catalog in Europe. Even going so far as calling Historex Agents in Dover and driving poor Lynn Sangster crazy on the phone for 2 hours. At a time when the best we could hope for was a list of kits with little to no description, Lynn patiently walked me through what to look for and helped me find what I wanted. A few hundred bucks and about a month later (this was the 80's) I got my first kits. Some Historex, some not so great kits and ....my first Metal Modeles kits. For someone who was used to the mediocre sculpting found on Tamiya plastic figures of the time, these were Rodins! The next big step was my first show. The New Jersey Historical Miniatures Associates show in Somerset, NJ in 1992. I remember putting up my figures for display, walking around and rushing back to take my stuff down. Compared to everything else on display, my stuff was crap. It was then I met Greg DiFranco and Andre Koribanics - two people that would become my mentors and among my closest friends to this day (Sadly Andre passed). Greg saw me taking down my work and asked why - then proceeded to give m my first ever critique - not criticism, but critique - what to do, where to improve, how to make things work - this is why I went to every show I could - to learn. It's also probably why I've never really cared if I won awards - I would and do, attend shows to see friends from all over the world, and learn. You never stop learning. Strive to be the best as your focus and believe me, the awards come. Like anything else, first attempts are tough - I kept a few of them just to remind me, but in the end, years of practice experimentation and listening to others will start helping you to produce better and better work. To become the best, you learn from the best and never, ever become satisfied - the minute you think something is "good enough" is when your work goes from great to average. So there you have it. A (hopefully) brief overview of how I got started without the boring details. Outside of this, or should I say, "in real life", I am married to my lovely, patient wife of 20 years who has for the last 28 years tolerated and even encouraged me to pursue this. I have two beautiful children I thank God for every day, who sadly prefer electronics to painting and I work in Communications for the number one technology company in the world - which keeps me pretty busy. All of this combines to produce a very low output for me these days, but it does allow for a few hours here and there. Maybe when (if?) I retire, and once my hands tremble from age and I can't do it anymore, I'll produce more figures per year. Thanks for visiting the site and look around. If you are a fellow painter, or aspire to be one, please feel free to reach out to me via the links at the bottom of each page. To me, this is a hobby. If I could make a living doing it, I am not sure I'd want to. The whole point for me, aside from seeing friends involved in it, is to relax. Yes, relax. So if it became "work" I think the point would be lost and most would start to resent it as much as they complain about their 9-5 lives. For the time when you are painting, nothing else matters - you need to be so focused that work, home, politics, bills - nothing else matters for that brief period. That being said, it is an art form. After all, it is no different than a painting in three dimensions. Each piece, even if a kit painted by a hobbyist/artist is unique and each piece is an expression of that painter. So technically it is art - as much as painting on a canvas by a "hobbyist" is art. Its a unique expression that combines the art with history. Of course there are "fantasy" pieces, but most of us still focus on historical - which requires research on the subject, the period and an understanding of context. Sadly these days the historical aspect is in decline. Most people don't bother with it, let alone care enough to read about it, so while the hobby may continue, the focus is shifting from historical to fantasy pieces. Which are gorgeous in their own right, and may allow more artistic expression, sadly drop the rich pantheon of history from which to work. Of course with a lack of new talent coming up - Xbox, PS, phones, tablets, PC's, etc. taking up ALL their time kids simply aren't interested in models or painting. Subsequently the local hobby shop, the place where many a father and son would spend countless hours looking through the latest kits have all but died off. With no one buying, prices inevitably go up to make up for the lost volume - taking kits from $5-7 in the 1980's to $65-100 today. Far out of reach for the kids who would buy them even if they were interested. Add to that paint, tools, "aftermarket" kits and each kit is now in the realm of old guys, not kids. So in the end, for many of us, this is just as much nostalgia as it is a passion for creating. It brings back a simpler time. 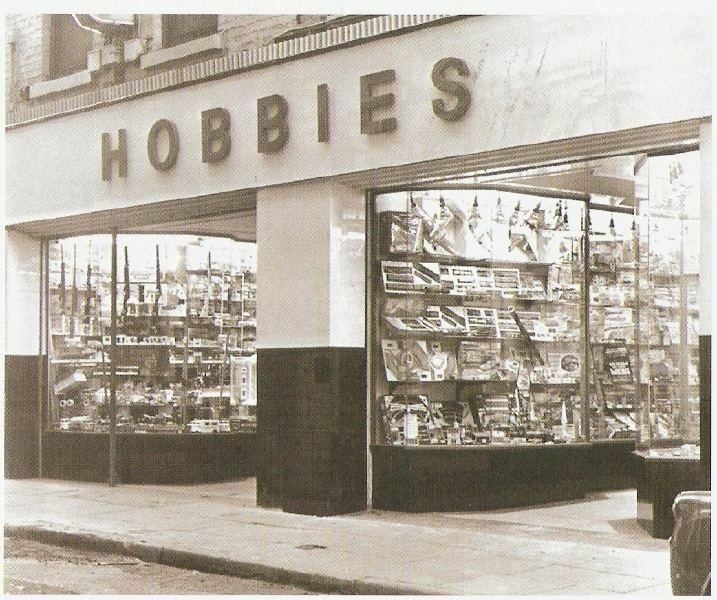 memories of spending time with our dads shopping, building, displaying and even just doing it on our own. Its not all sad though - with the technology of today, one can still buy kits, tools etc. easily online. More easily actually than ever before, with a number of retailers that cater to particular segments of the hobby and delivery that can be at your house in hours in some cases, or from Europe in much less time than it took to find out what you wanted to buy. Technology has also improved in materials, casting processes and in producing accessories that take a model and make it virtually indistinguishable from reality. I think most importantly technology has brought together hobbyists, painters, modelers - whatever label you prefer - together. Where you once had to wait months to attend a show to see your friend from England or France, and know him only through the hobby, you can chat with him, "meet" his family and develop stronger relationships through social media. Rather than have to wait for a show to see the latest kits available, they are in your inbox. To see the latest incredible piece, scroll through facebook photos, or learn something - watch YouTube videos. So though we in some ways lost what we had in the form of hobby shops and maybe the thrill of waiting for a delivery, we have gained in that the world has become a smaller place and thus we can see more, experience more and share more than ever before. Winning isn't everything. Frankly in many cases it isn't much. The reality of winning at a figure show is perhaps a metal trinket. A "medal" of distinction. While to me, winning awards has never been my ultimate goal - I do this because I love it, I attend shows for the dinners, drinks and hospitality suites, more than the "competition". I won't lie, it does feel good to win. Not because of the plaque, medal or trophy but the recognition of your peers - that people whose work you admire, admire yours. That is better than even a cash prize. Over the years I have been lucky to win the top awards at US competitions - Sadly I have yet to attend a European show, which are larger and more well attended- I have also had the honor of judging at most of them as well. If awards are your thing, and you want them, or that is your goal - and that's fine - one piece of advice I can give you is to not make it paramount. Focus less on the award, and more on what you're doing. Strive to be the best. Seek, solicit and accept advice and constructive criticism. You may not like some of it, but take it. Take it back and apply it on your next piece. Focus on that, never be satisfied and you will win awards. Being the best is not about having "talent" - it's about 1% talent and 99% perseverance. Practice. Paint. Over and over. Look. Observe. Ask. Borrow. And one thing I find particularly helpful is - experiment. There is no "right way", there is your way. No judge will ever knock you for your style, but you will lose points for silly mistakes - like not staying in the lines. I can't speak for plastic modelling as I don't participate in those shows as much as I'd like, but in the figure world, I can honestly say that in all of the endeavors I've ever undertaken in my life, I have never come across a group of people more willing to share their knowledge or experience with others. We don't "compete" - we participate and even shows aren't truly competitions in the traditional sense - they are more exhibitions in which the only one you are competing with is yourself. 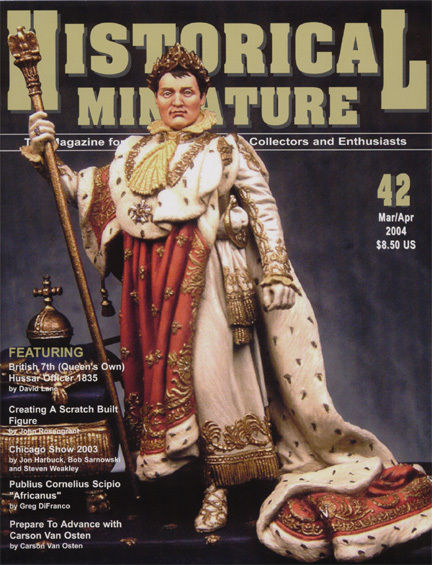 Summer 2000 Issue of Historical Miniature Magazine "Daimyo" - Winner of Long Island Historical Miniature Collectors Society "Best of Show"
You need a place to work. Some people layout a tarp on the kitchen table and hammer away, but honestly, I don't know how they do it. In some cases it takes 3 days for a figure to dry. Where the hell do they put them? For me, as I said earlier, I have patient wife. While I always had a spot in a basement - whether mom and dads or my first house - when my wife and I were looking for our second home, she let me make space for a studio a requisite with the realtors. Though they had no clue what that meant, they knew not to show us a house that wouldn't accommodate my workshop. So if you would like to know more about the hobby, or reach out to me, please use the form below.